Hi friends! 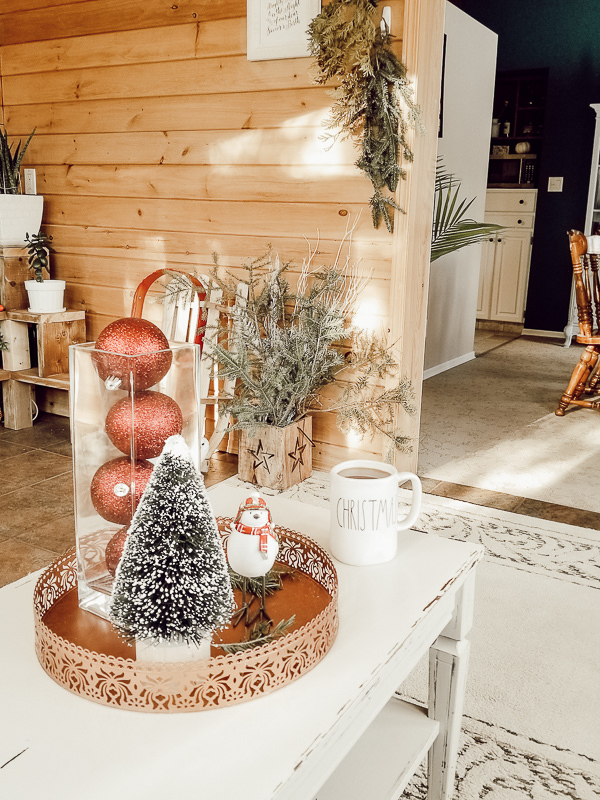 I’m so excited to share some of my Sunroom Christmas Decor Ideas with you today! 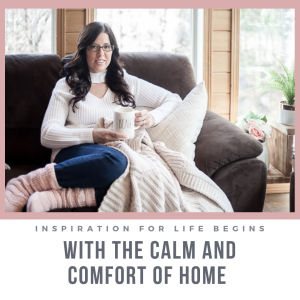 I’m so happy you’re here and hope this post inspires you to get creative with your own decorating. I always say to create what you love and inspires, and that’s exactly what I did with this tree farm idea. 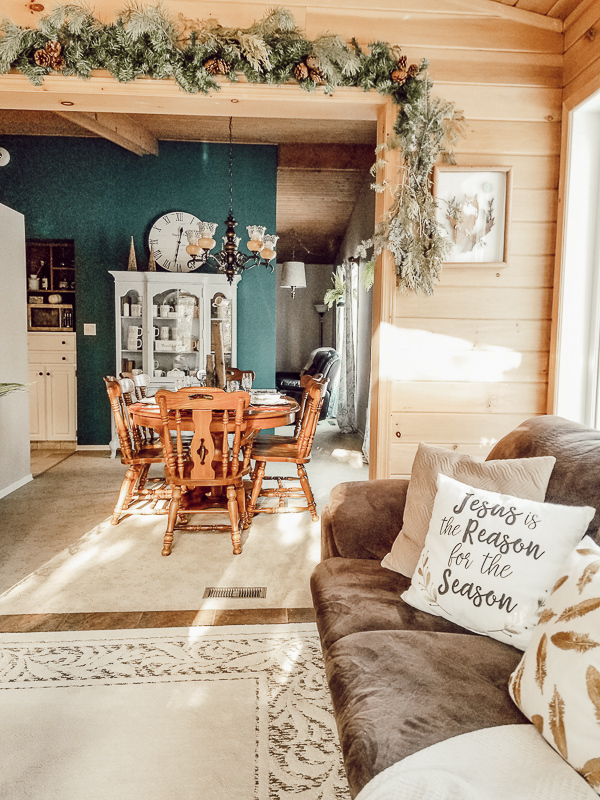 Besides the fireplace, the sunroom is my favorite place to decorate in our home. 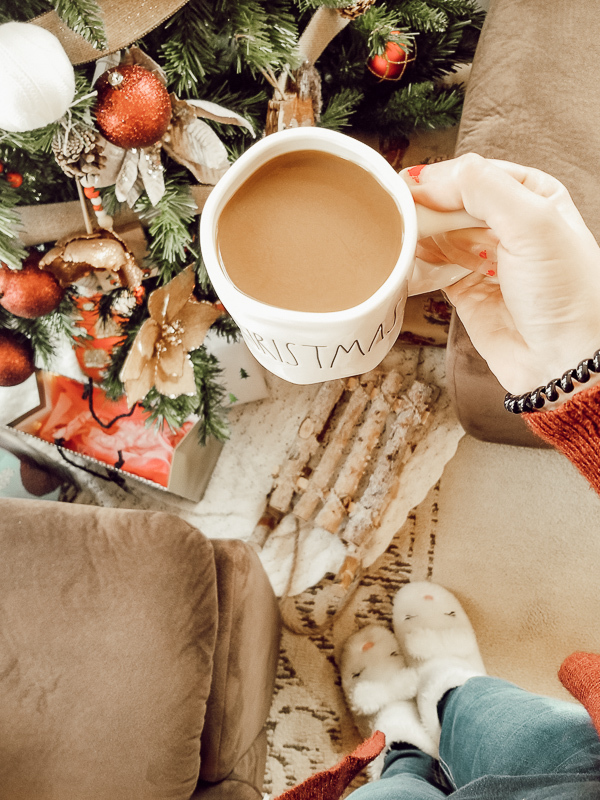 We always put the Christmas tree in this space and it adds such cozy vibes to the room. We usually have to shift our couches a bit to get the tree into the corner. Does anyone else have to do that as well? I always love using a tray on my coffee table. I had this one from the previous Christmas and added these items to it. It’s fun to play around with different objects and I decided to use my extra ornaments as a pop of color here. 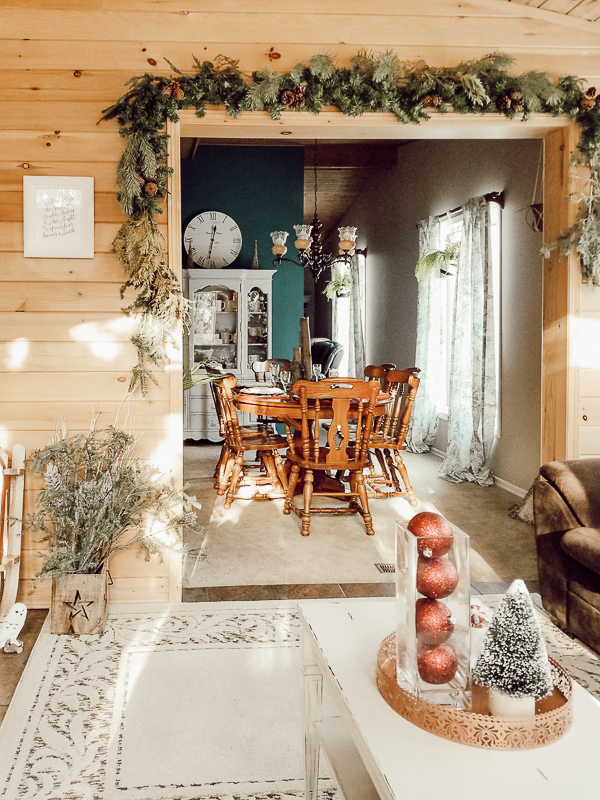 I have never really done a “theme” for Christmas before, but this year I went with a “tree farm” idea and used it as inspiration throughout our whole house. I blame it on a red truck I saw the previous year which I bought during Boxing Week. Then this year I kept seeing all things red trucks and, combined with every Hallmark Channel movie having a lets-visit-a-tree-farm scene, I’d say it was meant to be. My other “guide” for this theme also started last year when I purchased woodland animal ornaments. I asked myself, what can you find at a tree farm? Among many other things I’m sure, but these were my main elements of bringing this tree to life. I love using throw pillows for each season. This “tree farm” pillow was a great addition, found at Walmart. This “Jesus is the reason for the season” pillow was a find from a local greenhouse. I always love incorporating verses and song lyrics that represent the true meaning of Christmas. 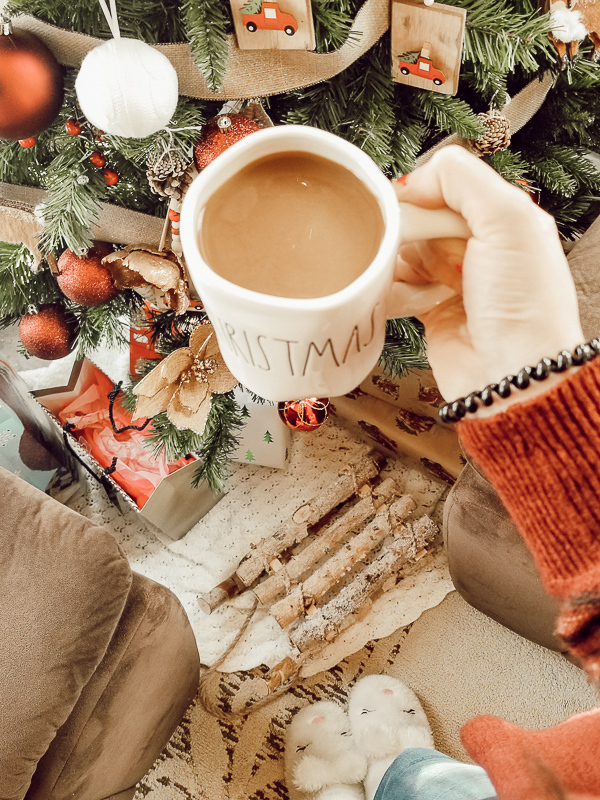 When I saw this adorable wooden sled at Home Sense, I knew it would be a beautiful piece to display not just this Christmas but for many to come. Those unique pieces add so much character and charm to a space. (Do you spot this sled? Another “unique piece” found at a garage sale). 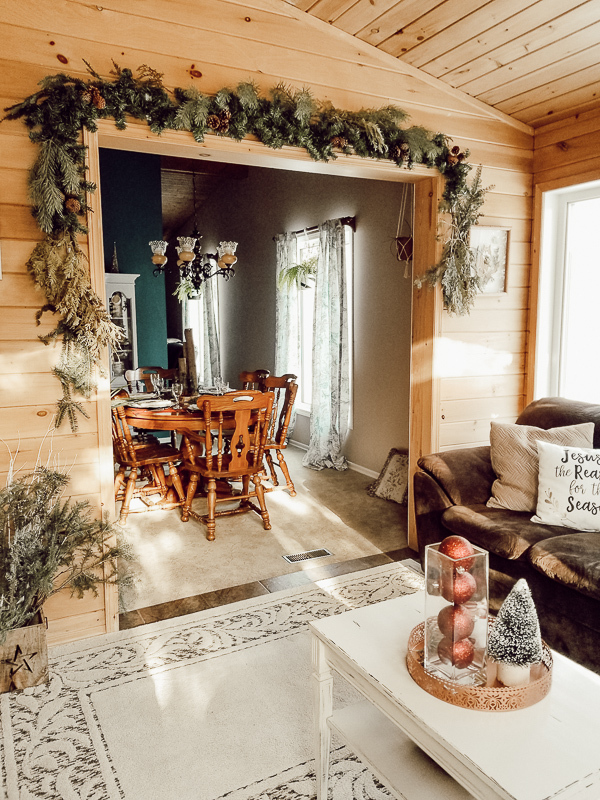 I created that massive garland with a mixture of faux garland and real pine and balsam fir bundles from a Christmas tree farm. Yes, I ended up going to a tree farm yet after all, thanks to my amazing husband who surprised me with a wonderful date! An overkill of photos for that one sign? Perhaps, but it’s my favorite Christmas sign I own and the perfect addition to this sunroom. 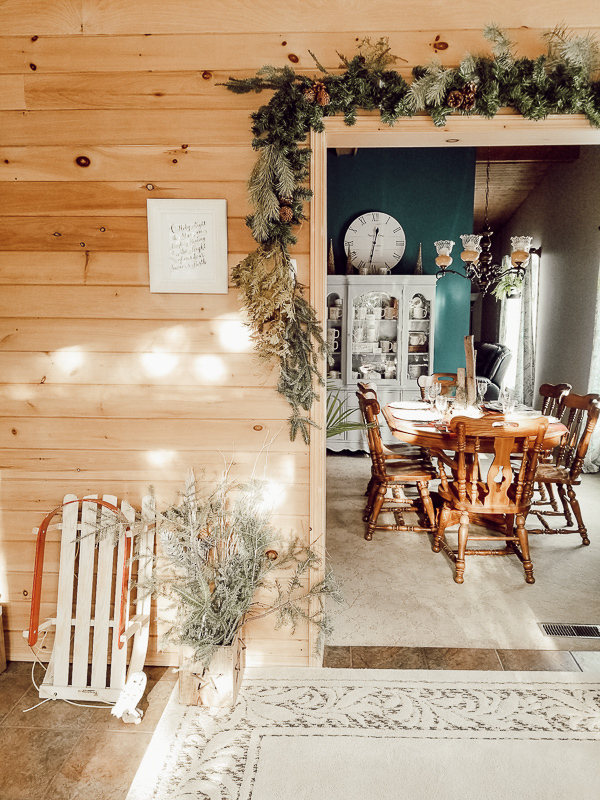 I hadn’t planned on breaking down my sunroom post in this way, but as I was looking through my gazillion photos, I realized that I could make it easier and more coherent if I broke it up into sections. I love the way it came together, this fun and inspiring Christmas tree farm idea. 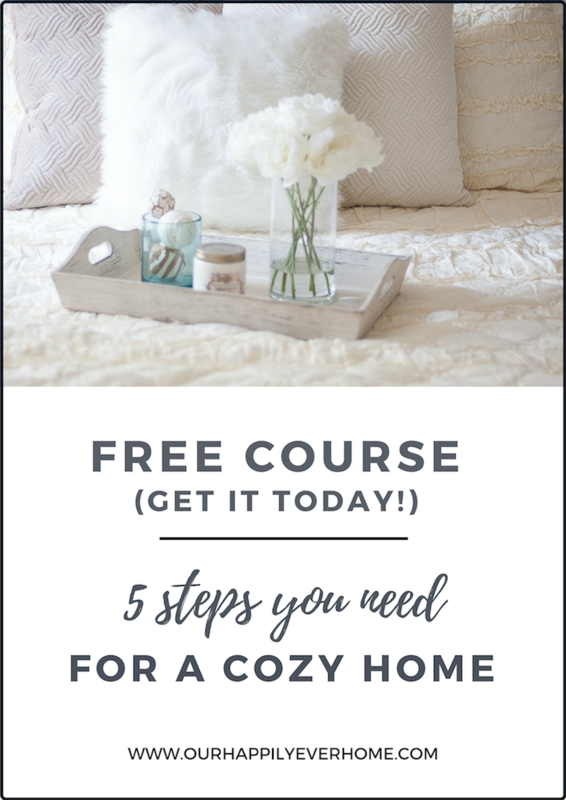 Hopefully it inspired you and gave you some ideas to start decorating your own home for this special time of year.